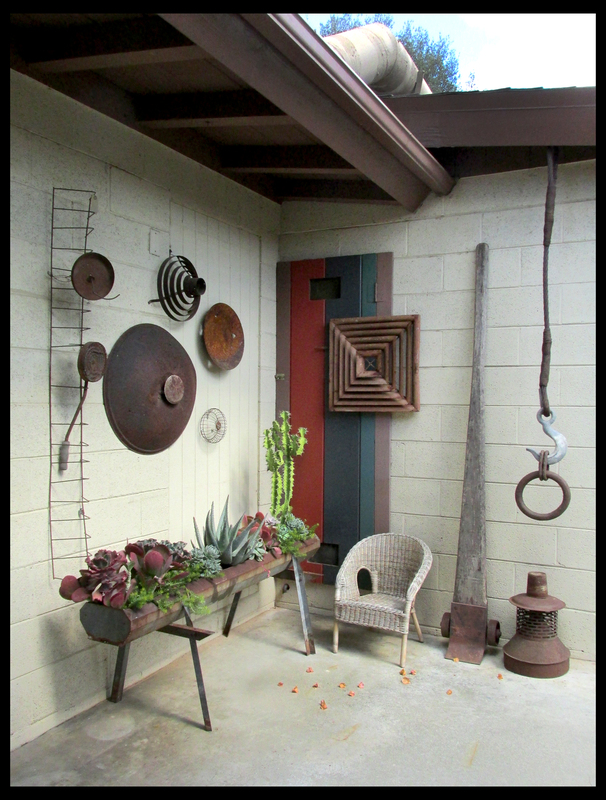 STYLE SNAPS: Think of them as supporting players; these are the moments between the larger — more “important” — designed areas at the Rancho. But that’s not to say these spots are any less essential to the Rancho’s overall look. They’re just as quirky, just as creative, and just as necessary in the overall scheme as those others. True, some may not be as overtly functional as, say, the seating areas, but they are useful … They may not seem like big aesthetic statements at first glance, but all of them sprang from an artistic impulse … Lastly, none of these spots are any less “Rancho” than those others; I lavished the same focus and attention on them and their creation as on all the rest. Like a parent referring to his children, I love them all the same. I hope you will, too! 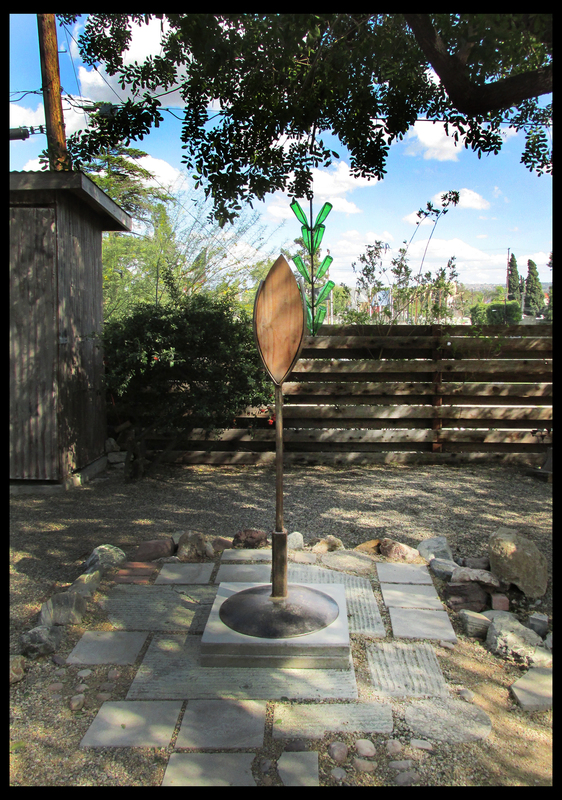 ONE MAN STAND: A very recent acquisition, this simple sculpture came from Stephen Penn’s Garden Shop in Riverside. Standing a combined 5’5″ tall (including concrete stand), the welded steel and carved wood piece has a subtly anthropomorphic presence on the former site of a little metal bench. The striated pavers are the recycled sides of a neighbor’s discarded vintage incinerator. ALL TOGETHER NOW: This little sculpture garden was born of necessity: I had these pieces strewn about with no place of their own and a photographer on the way. 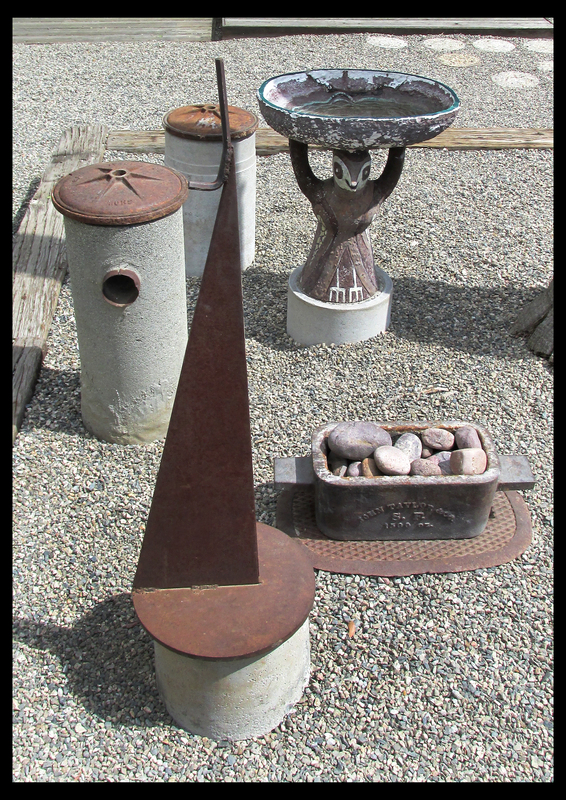 It took some quick stacking and arranging (and rearranging) for a rusted steel sundial, a T-bird birdbath, a cast iron smelting vessel and several concrete standpipes to form their happy association. SURREAL THINGS: What does one do with a vintage Belgian bathtub that’s been sitting on the sidelines to prepare it for an upcoming photo shoot? Well, first, one brings it front and center, placing it in a seating area. 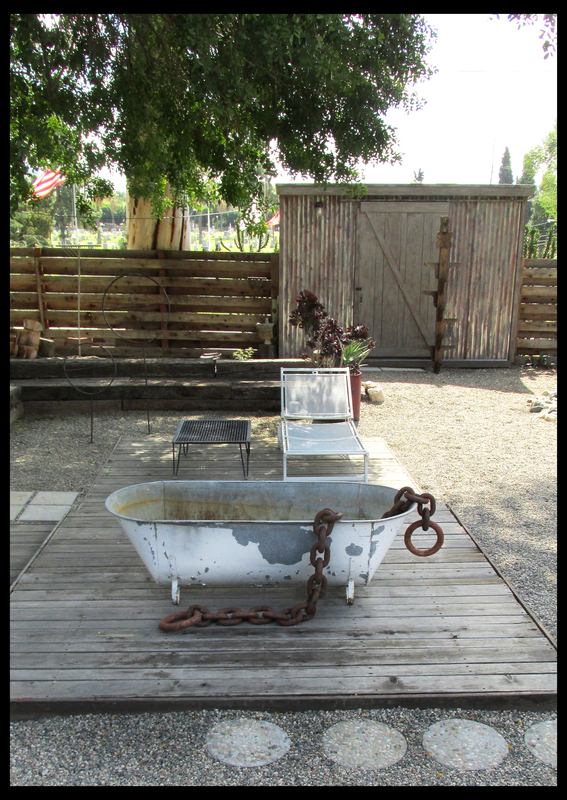 Then, one further emphasizes its odd presence by draping it with a huge rusted steel chain. Draped insouciantly, of course. 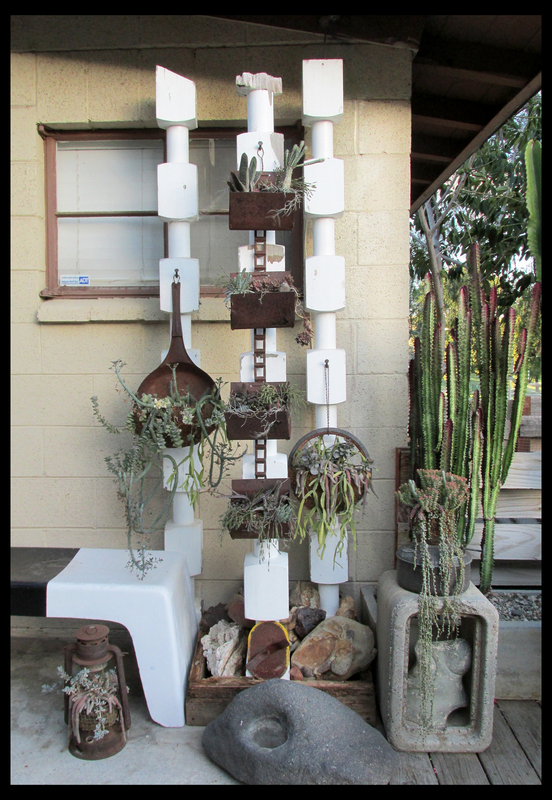 HAPPY HANG-UPS: Created by Riverside’s planter guru, Vickie Perez, these rusty beauties enjoyed lives as lanterns, a frying pan, dredging cups and a baby buggy’s wheel, before becoming home to succulents. The larger pieces are displayed on salvaged wood posts anchored by stones within a wood frame. THINK TANK: I bought this large rusted tank 2 years ago; since then it mostly floated around the yard without a clear resting place. It occurred to me that the tank, with its 4-ft diameter, might fit easily between the 2’x2′ concrete pavers of the lower tier; happily it did. 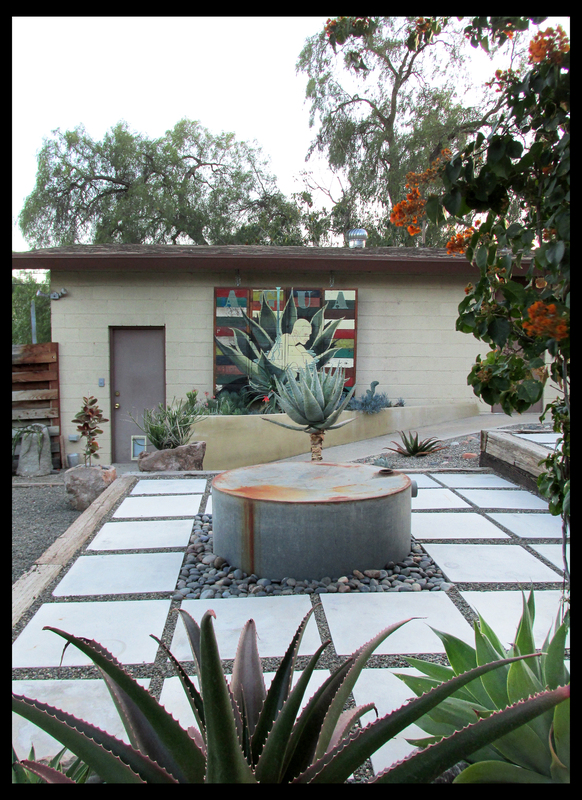 Now, surrounded by smooth river rocks, the tank provides a visual break to the paver’s grid and makes for a nice spot to ponder the suspended mural or surrounding landscape. INDUSTRIAL ART: A leggy elevated chicken feeder-planter is surrounded by an accumulation of rusted implements and other items … I like to think of these items as the farmyard descendants of Duchamp’s famous “readymades”, ordinary items elevated to the level of art simply by having been chosen by an artist and put on display. Less highfalutin, this corner is a great way to store disparate elements waiting for a more permanent home. Final series post: Lights Out! So inspiring. The string of pearls is my favorite. You just made my day! Agaain, it’s a delight to see your place thru the camera’s eye. What a title you’ve given me! I can’t begin to think of what I do in those terms…. I’m looking forward to getting back to work once I get this place back together. In whatever form. Of course, one can never put things back as they were. How boring. You should do a coffee table book of your photos, present and past. I would buy it for sure. Wow, everything looks great! I love it all! Just now realized how your garden is fewer plants this time around…or so it seems…love the name to the piece “THINK TANK”..